Second - Andrea has an announcement, so drop by and visit her, OK?! In a large bowl combine the pumpkin, oil, eggs and water; mix well. Stir dry ingredients (first 6 items) until combined. Fold in pecans. Spoon into two 9x5 loaf pans; bake at 350 for 60-65 minutes. Let cool for 10 minutes then turn out onto cooling racks. For glaze, combine sugar, brown sugar, butter and cream in a saucepan. Cook on low to medium until sugar is dissolved. Let cool for 20 minutes and then stir in confectioners' sugar and vanilla until smooth. Drizzle over cooled loaves. I still have pumpkin in my freezer from last year's harvest. This recipe sounds yummy! This sounds divine! 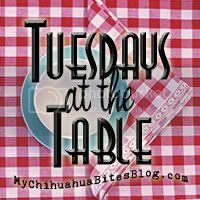 I'm excited to share my first post here for Tuesdays at the Table! The addition of the glaze sounds deadly and delicious. Great recipe! This sounds yummy! I make a similar bread using sweet potatoes! The glaze sounds really yummy! Many blessings! Thanks for hosting! This is my first time to post, too! I found you through Cara's blog! I look forward to all the great recipes! This sounds wonderful - do you have a photo of it? I've been on a pumpkin kick for the last couple weeks. I found a delicious pumpkin smoothie recipe. I saw this post and I had to go make another one, lol. Thanks for sharing! There is no pumpkin (canned) within 10 miles of me! My Publix mgr. said last yr. there was a bad crop and canned pumpkin may not be available till November!!!!! Your recipe looks yummilicious and I'm saving it to try the minute I can get my hands on the pumpkin!!! As if the cake recipe alone wasn't good enough, you got and add a caramel glaze? OMG! Oh my heck, tbis sounds AMAZING!!!!! That sounds like a great fall dessert! Thanks for hosting! Oh Yum. Gotta try this. Cole, this sounds yummy! And the glaze...ooh-weee! Ooooh, this looks REALLY yummy! I'm saving this recipe! YUMMY!! These are perfect for this harvest season! That sounds great. Thanks for hosting this meme. So many good recipes and so little time! blessings. Oh my goodness...this recipe looks dangerous!! OMG I hate you for posting this. But love you at the same time. I'm excited to see everyone's recipies!